What is a Winery Tour? A winery tour is a trip to visit one (or typically more) wineries. During these tours, visitors often meet the owner of the vineyard, tour parts of the grounds, and of course taste the wine that they produce. Visitors also frequently have the chance to purchase bottles of the wine produced at the vineyard. Sometimes this is a great way to get access to wines that haven’t yet hit the market or to purchase them at a price significantly less than retail. There are basically two ways that people can do winery tours. The first is planning a trip on your own. This involves a lot of leg work researching wineries in the area that you can visit, arranging to visit said wineries, arranging for transportation to these wineries, and arranging for lodging if you plan on doing more than a one-day tour. People seldom take winery tours designed on their own because, much like other similar types of vacations, consumers are at a disadvantage in terms of access to the winery culture. More often, consumers will go on a winery tour with a company that provide transportation and access to wineries. These businesses already have relationships with vineyards, they already have the modes of transportation, and all the other logistical details worked out. 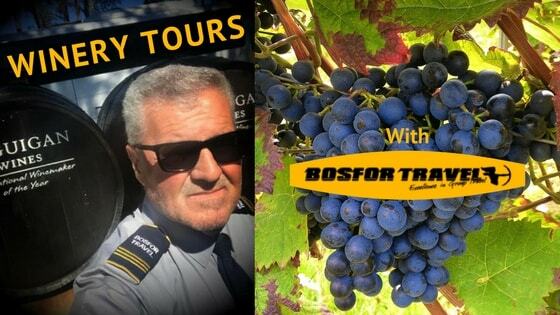 When you charter a bus for a winery tour with Bosfor Travel, you get premium coach services for large corporate groups or other groups of visitors. They have a dedicated fleet of high-end tour buses featuring air condition, bathrooms, televisions, and other comforts you can enjoy as you bounce from winery to winery. These 5 star coaches are the ideal choice for transportation on winery tours because you have room to stretch out. You aren’t confined to a car for hours and you can take along as many bags as you like. The helpful staff are also an added perk. They are knowledgeable about the region and can help you with entering and exiting the coach. They can also assist you with bags and any other questions you may have. Their buses are also regularly maintained and safety inspected so you can be sure you are riding in one of the safest modes of transportation available.